POIGNANT stones painted with a poppy have been created and placed by a Monkspath man to mark 100 years since the end of the First World War. After being shown painted remembrance stones online Philip Rowberry picked up his paints, brush and varnish once again in honour of the fallen. 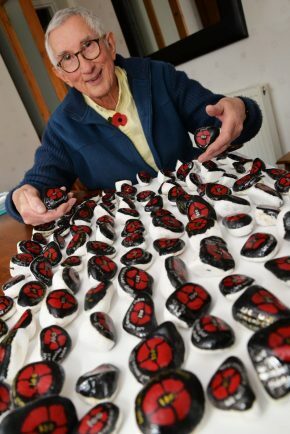 Initially the 71-year-old set out to paint 100 stones – one for each year that has passed since the guns fell silent on the Western Front – with a poppy on. However, after buying several bags of white stones he actually painted 325 with what he describes as a simple poppy and ‘We Will Remember Them’ on the back. Philip said: “It is an important year we all owe something to those who did their duty and to those who paid the ultimate price. “I have had such a positive response to the stones I have done. Philip was inspired by the Solihull Rocks initiative where Silhillians paint rocks hide them then wait for others to find them, who post the find on social media before re-hiding them – which he did paint some for over the summer. Philip has hidden some of his 325 stones in and around Monkspath he left some at the National Memorial Arboretum in Staffordshire. He said people have contacted him asking for some as a keep-sake while others have been taken to Belguim, France, Scotland and Wales in memory of the fallen.